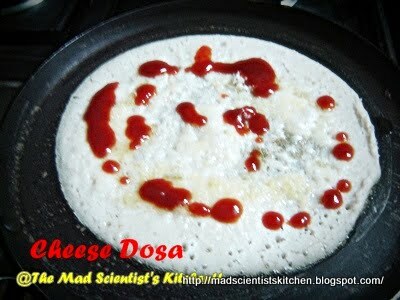 My daughter’s favourite, sorry one of her favourite breakfast is Cheese dosa. If this goes in tiffin Complaint Box goes quietly to school .Then comes back and complains that she did not get the dosa as her friends finished it. 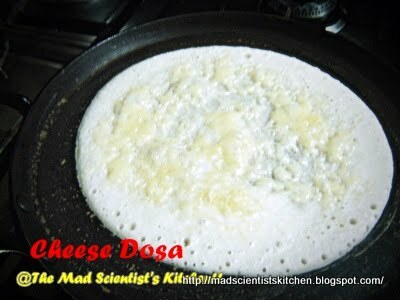 Make a plain masala dosa and grate cheese on it. Let it cook on one side only nice and crisp. You could flip it over if you want but it’s not necessary. She carries it with tomato ketchup. I am sorry I don’t have a picture of after it is cooked. I forgot to click it. Will post it next time. yay- finally am able to comment- the dish looks yum archana- my fav ! wow! !sounds tasty!! Dosa is one of my favourite…. I didn’t know that this is very simple to make..we have a cheese shop in the neighborhood and I'm wondering what sort of cheese to go with this..
@ Thanks Jeffery the cheese I have used is processed Cheese. The closest will be Cheddar Cheese.